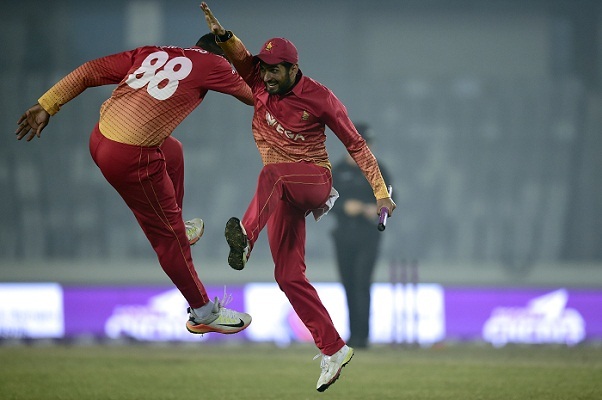 The 100th ODI at Sher-e-Bangla National Cricket Stadium witnessed a sparkling Zimbabwe for a 12-run victory against Sri Lanka in the 2nd match of the Tri-nation series on Wednesday. Chasing a target of 291 to win, Sri Lanka after a valiant chase ended up just 12 runs short, as they were all out for 278 with 11 deliveries still remaining! Opener Kusal Perera played an innings 84 off 83 balls with eight boundaries and two sixes, while Thisara Perera played a stormy innings, rattling up 64 with five boundaries and three sixes off just 37 balls. Sri Lanka needed 44 off 42 balls with 3 wickets in hand when Thisara Perera and Akila Dananjaya were not out on 44 and 5 runs respectively. But they ran out of steam and could only add 31 off 31, as Tendai Chatara got the last three wickets on his way to 4/33 off 8.1 overs. Pace bowler Chatara sent off Dananjaya on 261/8 in 45th over, while Thisara Perera on 275/9 in 46.4 overs and sucked the last blood Chameera on the Lankan final collection. Opener Kusal Perera, was caught by Blessing Muzarabani off Sikandar Raza, shared a partnership of 85 off 18.1 overs with and skipper Angelo Mathews (42 off 64b; 1×4;1×6) in the 3rd wicket stand to carry the team collection to 132/3 in 25 overs, starting from 47/2 in 6.5 overs. Another notable scorer, Dinesh Chandimal (34 off 33b; 3×4; 1×6) was bowled out by pacer Kyle Jarvis on 181/5 in 33.2 overs. Sri Lanka faced the first jolt on 46/1 in 5.4 overs as Upul Tharanga (11 off 17b; 2×4) was caught by Peter Moor off Kyle Jarvis, and then unfortunate Kusal Mendis was found with duck on 6.5 overs. He was caught by skipper Graeme Cremer off Tendai Chatara. Jarvis and Cremer got two wickets each for 56 and 62 runs while Blessing Muzarabani and man of the match Sikandar Raza took one wicket each for 47 and 54 runs for their side. Sent in to bat first, Zimbabwe played 50 overs where unbeaten Raza (81*) and Hamilton Masakadza (73) hammered half centuries to mount up a strong 290/6, showing persistent from the beginning as their opening stand between Masakadza and Solomon Mire shared 13 overs for 75 runs. Masakadza continued up to 142/3 in 27.3 overs to share another partnership of 57 off 11 overs with Brendan Taylor in the 3rd wicket stand, which started after the dismissal off Craig Ervine on 85/2 in 16.3 overs. Opener Masakadza featured 10 boundaries off 83 balls, before being caught by substitute fielder Danushka Gunathilaka off Asela Gunaratne. After Masakadza, Taylor failed to stay long with Raza, who shared a partnership of 57 off 10.1 overs in the 5th wicket stand with Malcolm Waller to carry the team collection to 226/5 in 43.1 overs from 169/4 in 33 overs, on the way to his unbeaten innings of 67 balls to fire eight boundaries and one six. Peter Moor gave a company of 6.3 overs to Raza for another partnership of 61 runs in the 6th wicket, which ended on 287/6 in 49.4 overs as Moor was caught by Akila Dananjaya off Asela Gunaratne. Taylor scored 38 off 51 balls, including four boundaries, while opening batsman Mire (34 off 37b; 5×4), Waller (29 off 35b; 2×4; 1×6) and Moor (19 off 18b; 2×6) were the other double digit scorers for the side. 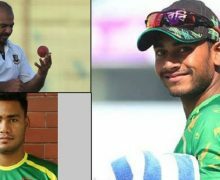 Riding on the pace strength, Sri Lanka got six wickets where Asela Gunaratne captured three for 37 in seven overs, Thisara Perera bagged two for 43 in 10 overs and Suranga Lakmal got one conceding the most runs 70 in 10 overs. This the 4th victory– 3rd successive — for Zimbabwe against Sri Lanka in the last six-encounters, since June 2017. 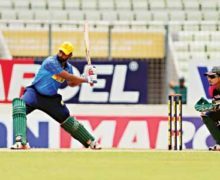 Sri Lanka will play the next game at the same venue on Friday against hosts Bangladesh the side secured an emphatic eight-wicket victory against Zimbabwe in the tournament opener on Monday.